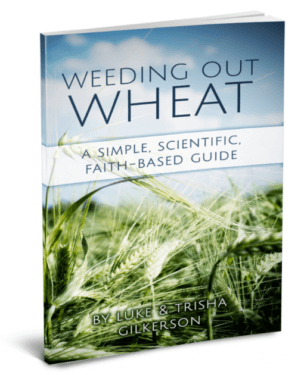 Luke and I have been trying to keep our carbs low and increase our fats. While most of the time that’s no big deal because we find that we just don’t get hungry very often, every once in a while it’s nice to have a treat. It’s nice to have a little something out of the ordinary. 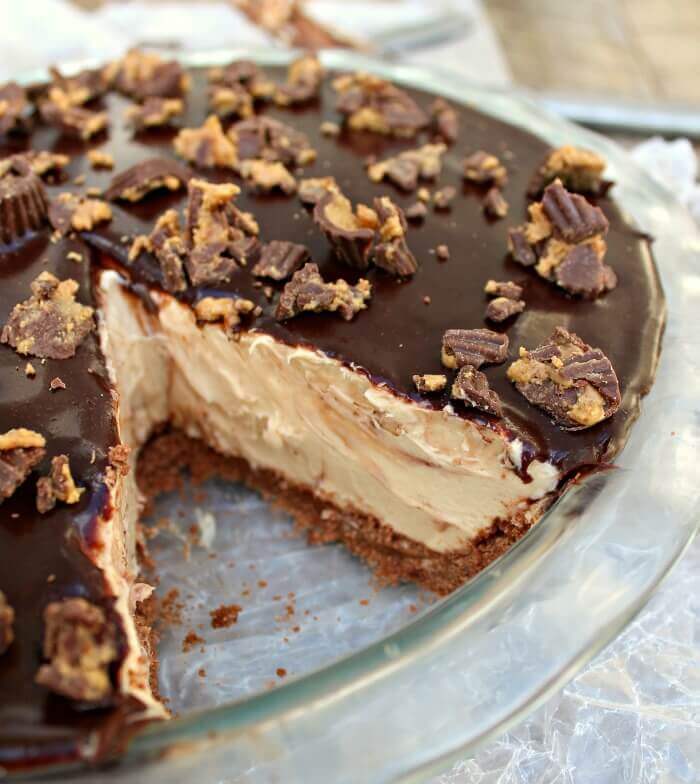 Enter: the Peanut Butter Cup Pie. It’s nice not to feel restricted. I like to focus on the foods I can have and not what I can’t have. It makes life so much more happy that way! With a low carb, high fat diet you can have delicious rich foods like cream cheese, bacon, coconut flour, and juicy well-marbled steaks. And Peanut Butter Cup Pie. Yum. 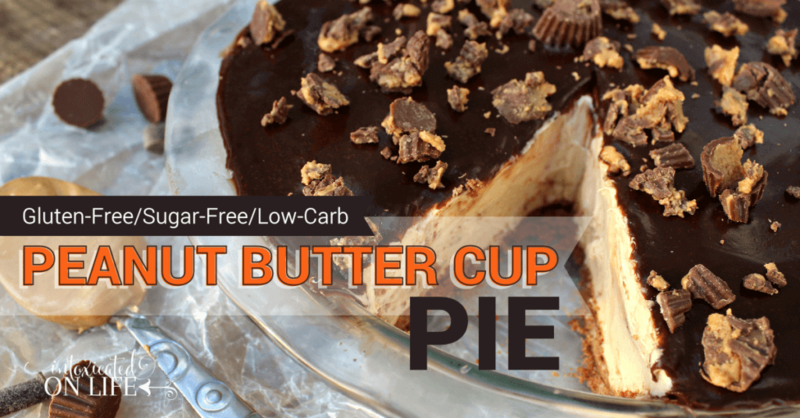 And like all of those delicious foods mentioned, this peanut butter cup pie, in moderation of course, is a fantastic treat on your low-carb, high-fat diet. 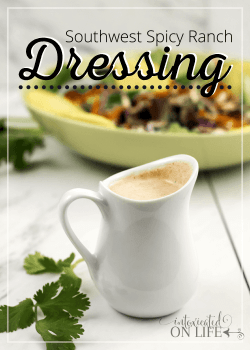 Want more ideas for grain-free recipes? 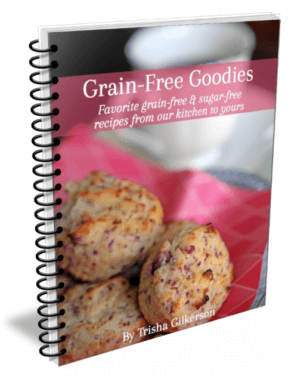 Check out my Grain-Free Goodies ebook for some delicious recipes. 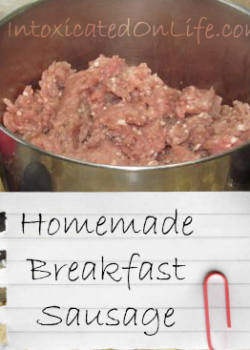 I used Truvia Spoonable in this recipe. Note, I did not use the baking blend. 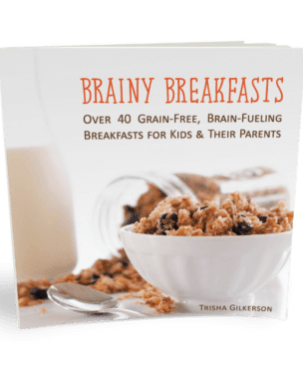 The baking blend has some sugar in it, whereas Truvia Spoonable is just erythritol and stevia. Erythritol is a sugar alcohol that’s similar to xylitol (you can read more about it here), but it tends to have less glycemic impact on people (ie. doesn’t raise your blood sugar much or at all). Most people are familiar that stevia is derived from the leaf of the stevia plant (read more about stevia here). 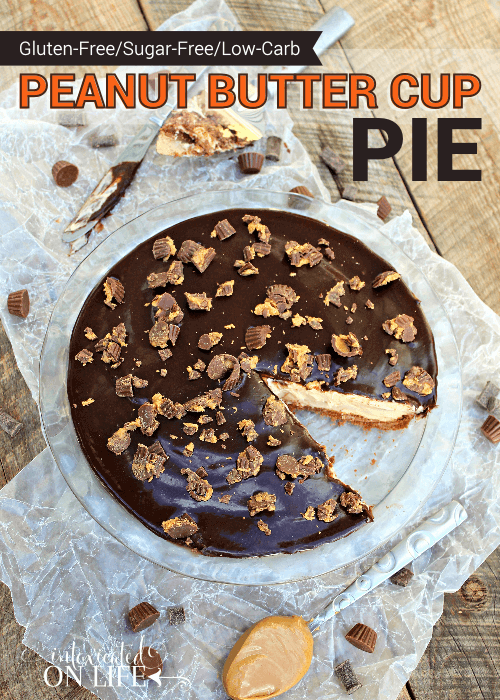 If you’re not too concerned with keeping the sugar out of this peanut butter cup pie recipe, you can easily sub the sweeteners out for sugar. I’ve indicated how much to use in the recipe. Mix all of the dry ingredients together in a small bowl. Pour coconut oil onto dry ingredients and mix well. Press into the bottom and up the sides of a 9" pie plate. Bake crust for 10-12 minutes. Beat cream cheese, sugar, and peanut butter together until smooth. Add heavy whipping cream and beat on high for several minutes, until filling thickens. Spread filling onto crust that's cooled to room temperature. Heat cream in a small sauce pan over medium-high heat. Stir frequently. Heat the cream until it begins to simmer, but remove from heat right before boiling. Add cocoa and sugar and whisk until smooth. Stir in vanilla. Let cool until about room temperature. Top your peanut butter pie and place back in refrigerator for at least 2 more hours, or until ready to eat. While I made this peanut butter cup pie for my husband and I, I soon found it didn’t last long. Four boys helped us with it, and it was gone much too quickly. You might have to hide this from the little people in your house if you want to keep it around for a few days! If you’re eating low-carb, high-fat tell me in the comments one food (or recipe) you greatly enjoy on this way of eating? Let’s focus on what we can have! 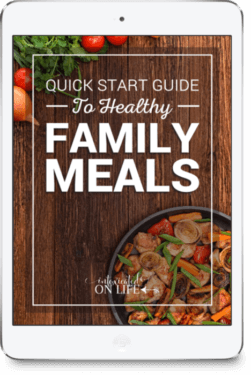 Sharing at Saving 4 Six, Juggling Real Food and Real Life, Pam’s Party & Practical Tips, Denise Designed, Mommy on Demand, The Modest Mom Blog, Written Reality, Mom’s the Word I Love to Hear, Pint Sized Baker, and Giving Up on Perfect. Is that nutritional information per slice!? That’s a lot of fat for one slice… that’s all your fat for a day! This looks utterly amazing! I can’t wait to try it! Thanks for sharing it! Not if you’re on a LCHF diet such as Keto. 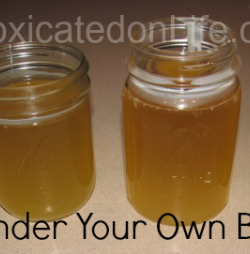 Do you think you could use honey as the sweetener? (in the pie/pudding part…not the crust)?